If you’re on the waterfront in Auckland, looking for an early dinner with kids, this restaurant is a good option. Very friendly staff are happy to accommodate children and will swap the fizzy drink for diluted juice without your child realising, if required. The $15 kids’ meals are big (the cheese burger would have been enough for an adult!) and come with a selection of vegetables, curly fries, a drink and dessert. 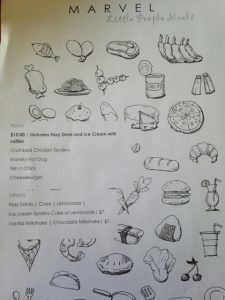 The kids’ menu also doubles as a colouring in sheet and there’s plenty to look at if you sit near the protective sheeting with lots of activity walking, running and cycling past along the waterfront. Marvel Grill also serve breakfast (and have kids’ breakfast items on the menu too) and lunch. This is well located to Silo Park if you’re looking for a playground visit followed by food! Open: daily 10am – late Monday to Friday and 9am – late Saturday & Sunday.